For all of you who are just getting started on your two foot travelling journeys, I want to offer a beginners guide to backpacking. Backpacking can be a wonderful, fulfilling hobby. Many might even call it a lifestyle. But it’s not one of those activities that you can just jump right into with no knowledge or equipment. There are essential skills AND essential gear that you will need, to be both safe and comfortable, on your trips. There are tons of backcountry products out there, many of which can be considered amenities. And it can get very expensive, very fast. So if you want to get out there right away but you’re lacking funds, how do you separate the amenities from the necessities? And how do you keep the cost down when you want to hit the trails fast but you can’t break the bank? In this post, you’re going to learn what gear you will absolutely need before you can start backpacking. We’ll cover only the bare bones here, there will be many things you will want to add to your gear stash as you continue backpacking. 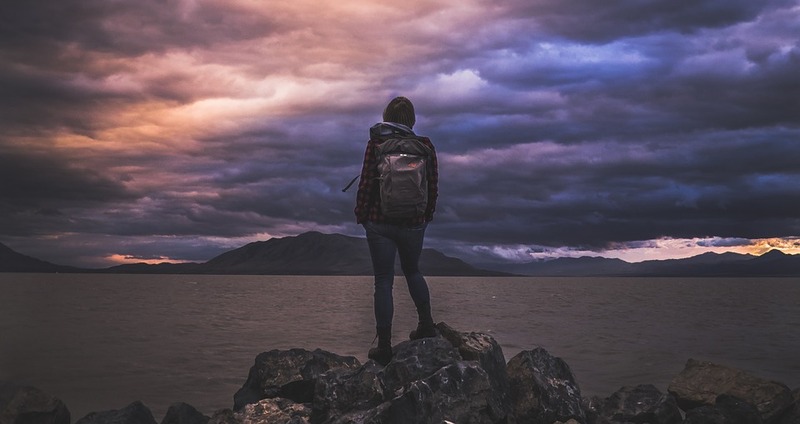 But if you’re starting from zero, want to hit the trails quickly, and don’t want to spend oodles of money right off the bat, then this beginners guide to backpacking is for you! We’ll talk about what you can’t go without, what you should splurge on, as well as some cheap backpacking gear alternatives that are still effective. This post is meant to be a starting point and overview, and as such we will not be delving too deeply into any one topic. Keep checking back or subscribe for future posts that will elaborate on each topic we cover briefly here. There’s just no getting around it. If you want to go backpacking, you’re going to need a backpack. You can find off-brand packs for cheap that work well for weekend trips. I have a 55L pack that I bought on Amazon for under 50 bucks. I’ve used it a handful of times and I have been quite satisfied with it. It’s small so you won’t be able to pack a lot of bulky gear in there, which is actually a good thing for novices who tend to pack too much. And it might not work for longer trips but it could be a good starting point for beginning backpackers. That being said, if you are sure you want to get into backpacking, you may just want to jump on in and get an excellent pack right off the bat. This could be one of those splurge areas and I’m not going to try to talk you out of it here. Spending $150-$200 on a great pack from the start would not be a waste of money if you keep backpacking for a long time. However, if you are not quite sure if you’re going to keep it up, then just buy a cheap pack! This may come as a surprise to many of you, but the answer is no. Most people automatically classify a tent as a camping essential. That isn’t quite true. Sure tents are nice. They’re easy to set up (hopefully) and we trust them. But they can be one of the most expensive, and heavy, items on your gear list. Remember, we’re talking backpacking here. That means carrying everything, including the tent. So you can’t just go out and buy your Walmart brand tent for thirty bucks. That tent will weigh fifteen pounds and have you collapsing on the trail because your pack weighs 100. A good, lightweight backpacking tent could easily run you $200 (or much more). And I’m not saying that isn’t a good investment. But this is an easy place to cut your backpacking budget down to size if you’re short on cash. So you’ve got a couple of alternatives here. Tarps are a double whammy, both lightweight AND cheap. You can buy one for around 20 bucks! Add some rope and a few tent stakes and 3 people can sleep easily under an 8X10 ft tarp. The main drawback (which isn’t much of a drawback when you think about it) is you need a bit of skill to set one up. But you’ve heard of YouTube right? Check out some how-to videos and you’ll be able to build a quality tarp shelter in no time! You always have the option of just sleeping under the stars. Of course, this leaves you open to the elements so I would only do this if you’re backpacking in a warm dry place. I have successfully slept with no shelter to speak of other than my sleeping bag in the deserts of Southern Utah. You can also fold a tarp over your sleeping bag, burrito style. This is something that’s taught in many boy scout troops and it’ll help you stay warm and dry, even if you don’t have a perfectly clear night. There are many videos on YouTube that will show you how to make this shelter through simply folding the tarp over you and your sleeping bag, or actually sealing the ends together beforehand to make a bivy bag. This is a great method that requires no ropes! You could even just have the tarp handy as a backup if your shelterless night gets interrupted by some rain, or if you end up getting too cold. One warning I will leave is that if you get stuck in a torrential downpour, your burrito will likely not hold up longer than a couple of hours. This happened to me when I got caught in some relentless summer rainstorms in Eastern Wyoming, and it made for a cold, miserable night I will never forget. Hammocks can be shelters and camp beds rolled into one. 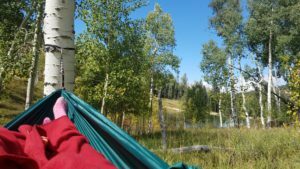 A hammock is an excellent option for the beginning backpacker who is looking to save money because it eliminates the need for a sleeping pad, is easy to set up, and you can find a ton of well-made reasonably priced hammocks on the market. However, hammock sleeping can be an acquired taste for some. Many people have trouble feeling comfortable while sleeping in a hammock through the night. But I have found that your comfort depends a lot on your setup, make sure your trees are spaced out enough so that you aren’t sleeping in a U-shape. You can also angle your body diagonally across the hammock to open up more space for yourself and avoid feeling squished. Ultimately, you should experiment and find out what works for you to maximize your own comfort level. The major drawback to a hammock is that the air passing underneath you can really cool you down beyond your comfort levels if you’re not prepared. But, depending on the season and location, a warm sleeping bag and wearing layers to bed can successfully eliminate this problem. Adding a cheap safety blanket underneath you also helps keep the heat in. You can buy one for about 5 bucks and even add adhesive Velcro to help it stay attached to your hammock. When you’re ready to get into the fancy gear, you can buy under quilts and topquilts and all sorts of fancy things to add to your hammock camping setup as well. And don’t forget that a hammock can be combined with a tarp shelter to keep a roof overhead if you’re expecting rain. This will help you stay warmer too! You’re going to need a sleeping bag. And don’t try to use your flannel bag that weighs 6 pounds and only compresses to about the same circumference of that old pine tree in your grandma’s backyard. When I started out I got buy with a synthetic sleeping bag that I “inherited” from my parents. It didn’t compress much but it also didn’t weigh a ridiculous amount. I stuffed it into my pack and it took up a lot of room. It was do-able but obviously not ideal. So if you’ve already got a sleeping bag like mine and a big enough pack, you can go ahead and use it if that’s what you’ve got to do to get started. But if you can swing it, I recommend you get a compressible down sleeping bag. 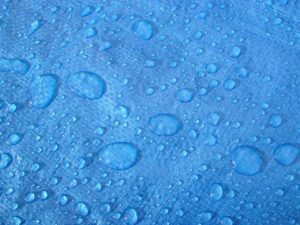 Down has taken the backpacking world by storm especially since hydrophobic technologies were developed to make it much more water resistant. Check out this post for the top three recommended down sleep systems. Great down bags can be quite expensive. But it is possible to find lesser known, quality sleeping bags for around $80. I have a down sleeping bag that weighs about two pounds, keeps me warm in the 40º range and compresses to around 3X8 inches. Unfortunately, that specific brand is no longer available on the market. Just know that bags like this do exist, so check around for them. You can splurge on the sleeping bag if you want, and get yourself a bag that weighs barely over a pound, is rated to zero degrees, with 800 fill power down, but you definitely don’t have to before you’re able to go adventuring. Like I mentioned before, if you’re hammocking then you don’t need a sleeping pad. But if you’re sleeping on the ground, you’ll want one. The cheap, starter way to go is to get a simple closed-cell foam pad. You can get one for around $20. This is not the most comfortable option but it’ll get you going. You can add a small piece of egg crate foam, that you cut out of an old mattress topper for comfort. When you’re ready to spend more (around $70-$200), then you can upgrade to an inflatable, backpacking mattress. You may be used to relying on your campfire for all your cooking needs but a stove is a backpacking essential. Many popular backpacking locations do not allow open campfires, and most of the meals you make as a backpacker will be much easier with a good stove. You’ve got options here. There are liquid fuel stoves as well as canister stoves. Expect to spend between $50 and $120 on a stove depending on the type you decide to go with. We’ll leave all the deep stove discussion for a later post, but a Pocket Rocket or a Jetboil could be a good starting place. 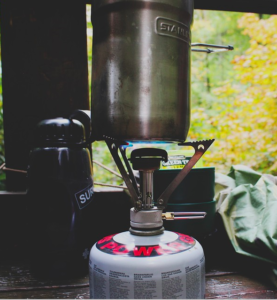 A stove is a necessity so pick one up before you head out there on your first trip, along with some cookware. There are kits you can buy but don’t overdo it. Kits often come with a lot of extra things you don’t need. Instead of buying a kit, you can just use an old kitchen pot you have lying around. Remove the handle and use a little pair of pliers instead. Pliers are useful for holding your pot and a whole slew of other duties. Add an aluminum pie tin that doubles as both a pot lid and frying pan, add a plastic spoon and wa-la, you’ve got a mess kit. If you’ve got a good water bottle like a Nalgene or a Hydroflask you can use it to drink any of your hot liquids out of it. No need for a mug. I also like to take a sturdy plastic food container with a lid and use that as a bowl/ plate. If you backpack with others than you won’t necessarily have to accumulate everything on this list yourself. If someone already has a tent then take that one and share the weight. Same goes for a stove and cooking items. But I’d wager you’ll still want your own sleeping bag and backpack. Obviously, this list isn’t exhaustive but It was meant to provide some insight into the big, items you will need to get started with your Two Foot Travelling. I hope you found it useful. And I hope you return often to find new posts that delve into the specifics of all of this gear and more. If you have any questions, comments, or your own money-saving gear advice leave them below! This sounds like a great way to start off. Once in a while you can find some of this gear in a thrift store if you are lucky. Normally those sort of items get picked over pretty quick so you need to be a little lucky when people are putting them out. I am still a beginner at all of this. I was wondering what you use for carrying water. Do you use a canteen or a hydro-pack? Thanks. I usually use an insulated water bottle, like a Hydroflask, and also take a plain old quart size gatorade bottle or something like that, filled with water. I recommend having at least one quality water bottle. I always carry at least 2 liters of water. If I need more than that then I carry it in a collapsible dromedary bag. This is a great post with many details and description of what to do when it comes to traveling. I’m myself not a adventurer but my wife and I will soon become “the broke adventurers” and these hacks will come in so handy. Our youngest boy needs to be a bit older so that we can leave him and our daughter with my mom. Thank you for sharing key points that I’m sure beginner travelers may or may not be aware of. Thanks for reading Victor! I hope you and your wife are able to get out on some adventures soon and when your children are old enough, take them with you! This is great. My wife and I sold our trailer last year but we still want to be in camping and want to get more down and back to earth. We want to hike and want to spend nights on those hikes. Should we have some kind of safety kit like bear spray, band aids and so forth? Yes! Because this post was only meant to cover the “big” items and help save money on them, there are many other things you will need to take with you when you backpack. You should definitely have a safety kit. And bring these essential items. You should also make sure to have the right kind of clothing layers and you can learn more about that in this post. Bear spray may or may not be necessary. If you are going somewhere with a lot of bears like the Greater Yellowstone Ecosystem, I would say yes. Check out this post for details about bear safety. I hope those help. I don’t yet have a definitive packing list of everything to take with you, but hopefully can write one up soon! Definitely traveling as a backpacker is something that many long to do sometime. However, not all of us do it at the right time. But it’s never late, right? If you want to take a backpacking trip with children, what do you think is the right age for them to do it with their parents? Thanks for reading Tommy! Backpacking with children largely depends on their and your level of physical ability and skill. I know expert backpackers who take babies with them! But, I would only recommend taking younger children if you are confident in your skills and ability to be responsible for your own safety and theirs. And you’ll have to be able to carry a lot more so that you can lighten your child’s load. Or if your child is very young you may even have to carry them. As you can see this can make backpacking a lot more difficult. Make sure that your trip length corresponds to the child’s ability. Don’t try to hike ten miles a day for instance. There is no one size-fits-all answer to this question. Basically just evaluate skills, age, and ability for each circumstance. This is a great overview. Backpacking can be intimidating so it is nice to have the basics all boiled down to these simple and practical suggestions. I have had the old fashioned flannel bags you mentioned as well as a host of other types. A good sleeping bag is probably the item I would be the most picky about…as well as the backpack itself for comfort. If I was somewhere comfortable I would not really care what kind of tent I had as long as it was not too heavy! If you camp somewhere with mosquitoes or other biting insects then a tent might be a necessity rather than an optional choice. I live in Alaska so sleeping out under the stars doesn’t really happen in summer. You will probably need to hide from the bugs here. I supposed a hearty soul could use a headnet. Thanks for the great suggestions to save money and weight and get started backpacking! You’re absolutely right! You will definitely have to adjust to your specific circumstances and location. I wouldn’t sleep under the stars in an area with frequent rain like the Pacific Northwest for example. As far as bugs go though, when it gets dark and cold the biting ones seem to disappear. I think they mostly hang around in the morning and evening. Of course I can’t speak for every location on that either. I guess you’re doing just great Mariah. This article will definitely save one a fortune while backpacking. You have done well in guiding beginners who intend on Backpacking. You made known what is required and what is not truly required and necessary. These tips are top notch to save money while considering embarking on backpacking especially for the broke. I really was surprised that you don’t need a tent, I hadn’t even thought of other alternatives to using a tent. The fact that you would have to carry something that heavy would be a big factor when you want to travel light. It might be a good idea to start your backpacking adventures with friends so you can share the load and the costs at least at first. It’s definitely a good idea to start out with friends! Not only because you can share the load, but it’s also true that there is safety in numbers. I always recommend going with someone who has already been backpacking before, and learning from them, when you’re just starting out. Mariah, thank you for this beginners guide to backpacking. I have been constantly thinking about going out on some adventures with my wife for some time now and I think I have found a great guide in your post. Knowing the essential things I need is a must and like you mentioned in your article, I don’t want to spend too much seeing that I am a complete amateur. This is new territory for me, but I will check your other articles where you delve deeper into some of the items you have in your list for more insight. Thank you! Thanks for reading! I’ve got several articles that will be helpful to you as you begin your adventures and I am constantly adding new content! I hope to see you back often. Wow. I love it. This was so helpful. I’m a total overpacker and would be dragging around a huge tent if I went backpacking. I was not aware of down sleeping bags that could be rolled up so tiny and still keep you warm in 40 degree weather. I also hadn’t thought about getting cold in the hammock because of the wind blowing under you… thanks for the for-warning. I know this was meant to just be a brief overview of essential items needed for backpacking but do you have any recommendations for keeping wild animals away? Yep, the big one is just don’t leave any food out. Also, avoid camping on an animal trail. Check around you for signs of animals. And know what types of animals are likely to be in the area. For example, you should know whether or not bears live in the area. If you do go backpacking in bear country follow these rules. I’ve slept out under the stars a few times and I’ve got to say, there’s nothing quite like it. I love your simple gear recommendations and I agree, the 55L backpack is a great starter pack. It’s big enough to carry enough for a week, yet small enough to carry on a plane. Yep! I have used it for both of those purposes! Let’s talk backpacking food. Most people go for the Mountain House (or various other brands) dehydrated packs of food. But those things run from $10 each and only give you two servings. I recommend people buy dehydrated food which is often found in bulk at some grocery stores. I’ve found dehydrated milk, potatoes, beans, etc. If you’ve got your own dehydrator, you can even dehydrate pasta and sauce! Now that would be delicious after a long day of hiking. Do you have food recommendations? A sample menu would be cool.